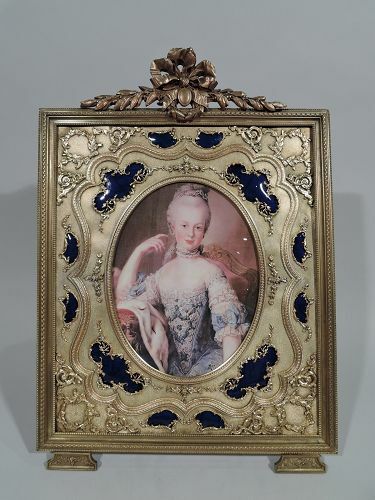 French Rococo Revival gilt bronze and blue enamel picture frame. Rectangular with bracket feet and substantial leaf-and-ribbon crown. Vertical oval window in gilt surround with applied wreaths, ribbons, scrolls, and flowers, and shaped cobalt enamel reveals with gilt bow-tied garland borders. Beading, dentil, and imbricated leaves. With glass, textile-lined back, and hinged support. Very good condition. 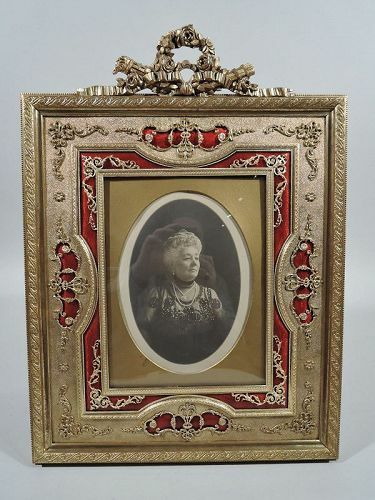 French Rococo Revival gilt bronze and red enamel picture frame. Rectangular with substantial crown in form of garland wreath, ribbon, quiver, and torch. Vertical rectangular window with double border of red enamel and gilt. Shaped red enamel reveals applied with wreaths, scrolls, and flowers. Rinceaux and beading. With glass, and metal back and hinged support. Fine condition. 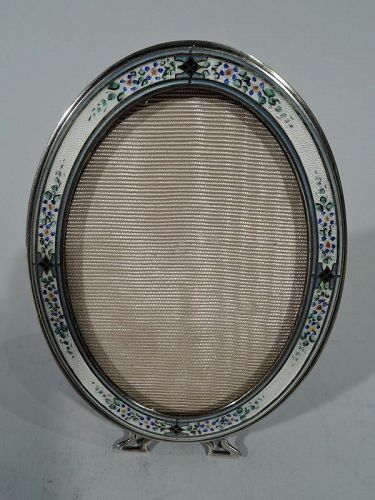 Charming sterling silver and enamel picture frame. Made by Thomae in Attleboro, Mass., ca 1950. 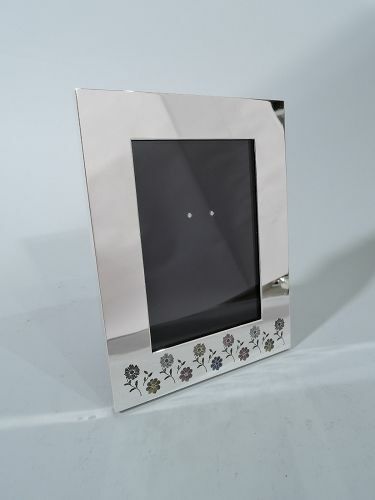 Rectangular window and plain wide sterling silver surround. At bottom are enameled flowers – pretty pink, white, yellow, and blue blossoms. With glass and laminate back and hinged support. Hallmarked. Condition: Clean and crisp with intact color.